Disability is a potentially limiting difference in the functioning of the human body. Disabilities can influence both the physical and mental well-being of a person, and they can have a strong impact on self-esteem and social adjustment. Disability is a deviation from the normal range of functioning that places a limit on what a person can do or that imposes special conditions or needs that must be met to allow a person to function in the normal range or up to his or her full capacity. Disabilities can be mental, physical, psychological, or a combination of all three. The disability may be obvious to the casual observer, such as the loss of a leg, or invisible, such as a back injury. Some people prefer to refer to anyone whose range of function falls outside the norm as "differently abled," to stress that the condition is a difference rather than a lack of completeness. Many people with so-called disabilities do quite well meeting the challenges of life. Where Do Disabilities Come From? Inherited disabilities: Some disabilities are the result of genetic * disorders, for example, cystic fibrosis * . Exposure of the mother to disease during pregnancy: For example, a mother who has rubella * early in pregnancy may have a child who is deaf or who has other birth defects. Exposure of the mother during pregnancy to alcohol, drugs, harmful medications, pollutants, or chemicals: For example, if a mother drinks during pregnancy, she may have a child with fetal alcohol syndrome * . Difficulties arising during the birth process: Complications can arise during the delivery of a baby, for example, the loss of an adequate oxygen supply to the brain, which can lead to brain damage and mental retardation. Some people hold superstitious beliefs that birth defects are punishment for the sins or evils done by the parents or that they occur because the mother has been cursed during pregnancy. Although these ideas are clearly false, people with disabilities and their families sometimes must confront these unfounded beliefs in themselves and in others. Disabilities also can be acquired at any time after birth. Acquired disabilities commonly arise from accidents, illness, working conditions that expose a person to an unhealthy environment (such as coal miners who breathe in coal dust), or repetitive physical stresses (such as repeated heavy lifting). Self-image is the mental picture we have of ourselves, including our external appearance, our intellectual abilities, our strengths, and our weaknesses. This mental picture begins to develop in infancy and continues to grow and change throughout life. People develop their mental pictures through their interactions with other people and the world around them. Self-esteem is strongly linked to self-image. Self-esteem is the value that people put on the mental image that they have of themselves. * genetic pertains to genes, which are the chemicals in the body that help determine physical and mental characteristics, such as hair or eye color. They are inherited from a person's parents. * cystic fibrosis is an inherited disease of the body's mucus-producing glands that usually appears in early childhood. It mainly affects the respiratory and digestive systems and can lead to difficulty breathing and infection in the lungs because of an accumulation of abnormally thick mucus in the airways and lungs. * rubella, also called German measles, is a viral infection that causes a rash and fever. * fetal alcohol syndrome, which occurs if the fetus is exposed to alcohol, is a condition that can be associated with mental, physical, and behavioral differences. Oppositional behavioral problems, learning difficulties, mental retardation, and retarded growth can occur in the children of women who drink alcohol while they are pregnant. Children who are born with a disability do not realize immediately that they are different from anyone else. Generally, children start to become aware of physical differences in human bodies, such as differences in hair and skin color, body size and shape, and gender, by their second year of life. Over time, children with disabilities realize that they are in some way different from most other people. At first this difference is neither good nor bad to them. Since congenitally disabled people may have never lived in a nondisabled body, they often feel complete, intact, and "okay" with the disability, even though the outside world may view them as different. Children whose parents accept them, support them, show pride in them and their abilities, and communicate factually and directly about the disability are more likely to develop good self-image and self-esteem. When parents of children with disabilities encourage them to change and act more like "normal" people, hide their limitations, or dwell on things that they cannot do, the children may feel frustrated, unaccepted, and disappointed at not living up to their parents' expectations. When they are faced repeatedly with other people's negative reactions to their limitations, people with disabilities may come view themselves negatively and develop a poor self-image. The conflict between "owning" a disability and making it part of oneself versus trying to get rid of the disability to become more like other people can be seen in the current debate in the deaf community about cochlear (KOK-lee-ar) implants. When these devices are installed surgically in a deaf person's inner ear, they allow some deaf people to hear, but not like "congenitally hearing" people do. On one side of the debate are people who were born deaf and who are comfortable with their deafness. They see deafness and deaf culture as part of their identity, and they do not want to change. On the other side are those deaf people who believe that it is in their best interest to enter the mainstream of hearing people, if that is possible. People who acquire disabilities later in life have a different experience from those who are born with a disability. These people have lost something that has played a part in the development of their self-image, whether it is an arm or leg or the ability to perform a particular activity. People with acquired disabilities tend to go through a grieving process similar to the grieving process for any other major life loss. Their emotions usually follow these stages: grief, denial, anger, depression, working out a new way to live, and acceptance of the disability. Unfortunately, some people get stuck on one or more of these steps and may never reach the last two steps. Chronic illness is a special kind of "disability." There are different kinds of chronic illnesses. Some illnesses, like diabetes * , often can be managed by the family doctor without hospitalization or pain. Others, such as back or neck injuries, can severely limit activities and may require treatment for pain with medications that may have some undesirable side effects. Progressive chronic illnesses, such as muscular dystrophy * or Alzheimer disease * , get worse with time and eventually can lead to death earlier than expected. * diabetes (dy-a-BEE-teez) is a condition in which the body is unable to take up and use sugar from the bloodstream normally to produce energy. It is caused by low levels of in-sulin (the hormone that controls this process) or the inability of the body to respond to insulin normally. * muscular dystrophy (DIS-tro-fee) is a group of inheriteddisorders that causes muscle weakening that worsens over time. * Alzheimer (ALTS-hy-mer) disease is a condition that leads to gradually worsening loss of mental abilities, including memory, judgment, and thinking, as well as changes in personality and behavior. 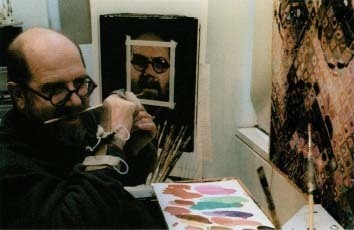 In the middle of his career, artist Chuck Close became partially paralyzed due to a blood clot in his spinal column. To continue painting, he developed a technique that allowed him to work with his weakened hands from his wheelchair. He is still able to create the large, multicolored portraits for which he is known. at their caregivers or feel inadequate and embarrassed by the extra burden they place on loved ones. Several studies have shown that males have more emotional problems when they are faced with chronic illness than females, although researchers are not sure why this is true. It should be stressed that chronic illness does not necessarily result in chronic problems with self-image. Most people with chronic illness would not consider themselves disabled, and generally, with good health care and family support, they deal effectively with their illnesses. Most physicians and mental health practitioners agree that there is a connection between mental health and physical well-being. In general, the better a person's self-image and self-esteem, the more able a person is to cope with life's ups and downs and the better a person feels both mentally and physically. Many studies have found that people with disabilities experience psychological problems (especially depression and anxiety) and behavior problems at about twice the rate of the non-disabled population. Family members of people with disabilities are also more likely to experience emotional problems brought on by the extra responsibilities, financial burdens, and limitations of caring for someone with a disability. Though chronic illness and disability include the risk of psychological problems, most individuals and families learn to cope with these conditions. In 1996, the American Academy of Pediatrics reviewed many studies of people with disabilities and concluded that certain risk factors increase the chance that people with disabilities will experience psychological problems. Other "protective" factors appear to decrease the chance that a person with a disability will have psychological problems. overprotectiveness on the part of parents or caregivers. a strong support network in the community. Myth: Disabled people are usually mentally retarded. Reality: Most disabilities do not affect intelligence. Myth: Disabled people are sick. Reality: Illness is not the same as disability. Some people are disabled with chronic illness, while others are healthy. Myth: People with disabilities can never have a good quality of life. Reality: The quality of life mainly depends on the character of a person and society's acceptance of a person than on the disability itself. Myth: People with disabilities need continuous supervision and cannot lead independent lives. Reality: The degree of independence a person achieves depends on the nature of the disability, the person's education and training, and the accommodations that are available to make independent living physically possible. Myth: People with disabilities are especially noble, brave, and courageous for coping with their handicaps. Reality: There are all kinds of people with disabilities. Most disabled people carry on with their lives just as non-disabled people do. The Americans with Disabilities Act is the federal law that is intended to integrate people with disabilities into mainstream life as much as possible. It requires that disabled people be provided with access to public and private spaces and with workplace accommodations and, whenever possible, that they be induded in mainstream public education. Although physical accommodations, such as wheelchair-accessible restrooms or Braille instructions for the blind on automatic teller machines, are common in new buildings, many older facilities and private spaces still have not been renovated to accommodate people with physical disabilities. 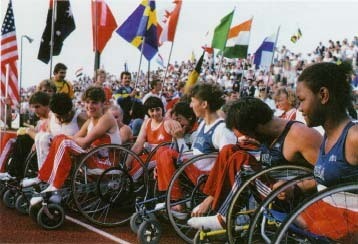 Hundreds of wheelchair racers gather for the International Games for the Disabled, 1984.
their skill levels. Service industries hire more people with disabilities than any other type of employer. Ignorance on the part of the non-disabled is still the greatest barrier to achievement of their full potential for people with disabilities. People with disabilities face some common challenges. At the same time, disabled people are also individuals with differing characters and needs. People who are born with a disability have self-image issues that are different from those of people who acquire a disability later in life. Someone who is confined to bed with a chronic (long-term) illness faces challenges that are different from someone who is healthy but who has a disability such as blindness or mental retardation. Although researchers can draw a group picture of people who are disabled, this picture does not represent an individual with a disability any more accurately than a general picture of the "average American" represents a non-disabled person. Our society must learn to see people with disabilities as individuals, each with his or her own strengths, weaknesses, hopes, and dreams, before people with disabilities can achieve full equality. Kent, Deborah, and Kathryn A. Quinlan. Extraordinary People with Disabilities. New York: Children's Press, 1997. Profiles of more than 50 people with various disabilities. Center for Disability Information and Referral, Indiana Institute on Disability and Community, 2853 East Tenth Street, Bloomington, Indiana 47408-2696. This organization, which is associated with Indiana University, provides referrals for all types of disabilities. They also have an educational website for disabled and non-disabled children. disAbility Online, a website provided by the United States Department of Labor, addresses work and education-related disability issues. The site includes a state-by-state resource guide.